Abraham Maslowwhich in "The Psychology of Science" p.15. Of course, my World was a Slightly Different Place then. As a teenager, at the conscription 'Medical and Mental' screening, i indicated i was Unwilling to Touch any Arms, but willing to do what would probably translate as "Substituting Conscription" where you preform some 'Civilian Duties'. How have my opinions Changed? "upholds the claim to the monopoly of the legitimate use of physical force in the enforcement of its order." Max Weber-Politics as a Vocation. Almost on This Ground Alone, i have come to the conclusion that i feel people have the Right to Keep and Bear Arms. I think Most People will agree that a Monopoly is Never a Preferred Option, although Most People will also think they are talking about Commerce than. An other reason why i feel People have the right to Arm is the Right to Protect Property. They should Not hand Responsibility for that over to a "State"
A term first coined during the Cold War, but now used again in the propaganda... (oh, Sorry... that was the Communists... We Don't have That here...) 'spinDoctors' for the War on Terror's justification for 'Armed Intervention' is what they call; 'the Pre-Emptive Strike'... In this way, the offence is really a defence! How clever is that!!! Pre-emptive strikes: A pre-emptive strike is military action taken by a country in response to a threat from another country - the purpose of it is to stop the threatening country from carrying out its threat. 'it is carried out before the other side attacks with military force, and so makes the side carrying out the strike the aggressor'... ? Could it be that the Wording of this Definition on the Ethics Guide has a Slight Bias? Could it be that the "US-UK Special Relationship" did in any way or form Helped formulating this definition? sidetracked... sidetracked. Back to ' pre emptive strike'. How does that work? Göring: Why, of course, the people don't want war. Why would some poor slob on a farm want to risk his life in a war when the best that he can get out of it is to come back to his farm in one piece? Naturally, the common people don't want war; neither in Russia, nor in England, nor in America, nor for that matter in Germany. That is understood. But, after all, it is the leaders of the country who determine the policy and it is always a simple matter to drag the people along, whether it is a democracy, or a fascist dictatorship, or a parliament, or a communist dictatorship. The Cenotaph is the war memorial in Whitehall, London. the word "Cenotaph" means "Empty Tomb", it is "a monument erected in honour of a person or group of people whose remains are elsewhere". Many towns throughout the United Kingdom and in fact throughout the world have erected cenotaphs. I don't have a problem with this at all. 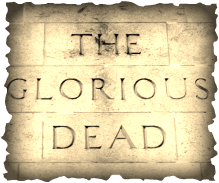 Since when are the dead, Especially War dead, glorious? "Dumb stupid animals to be used"
instead of their real enemies back home in the capitals"